Born in Kagoshima in the Satsuma domain (present-day Kagoshima Prefecture) Saigō Takamori was one of the Satsuma samurai supporting the Meiji Restoration. He has often been called the “last true samurai”. Saigō was an early opponent to the Tokugawa shogunate. He was exiled from 1859 to 1864 to Amami Ōshima island, then returned to assume command of the Satsuma troops based in Kyoto. He formed an alliance with samurai from Aizu domain against the forces of rival Chōshū. After the Meiji Restoration he became advisor to the new Meiji emperor and first staunchly rejected the Westernization of Japan. In 1873, while many senior statesmen like Ito, Okubo or Kido were abroad on the Iwakura Mission, Saigo pressed the government to invade Korea, so as to punish it for not opening relations with the new Meiji government. When the Iwakura Mission returned to Japan in September 1873, Saigo’s plan was rejected, partly from budgetary considerations, and partly from realization of the weakness of Japan compared with the western countries. Saigō took badly what he thought was an rebuttal and suffered a breakdown. He retired from the government with a group of like-minded dissidents and returned to Kagoshima. He soon gathered supporters among disenchanted samurai and those harbouring ill intentions against the central government. Satsuma samurai who were labeled as rebels of the new Meiji government lead by Saigo Takamori. 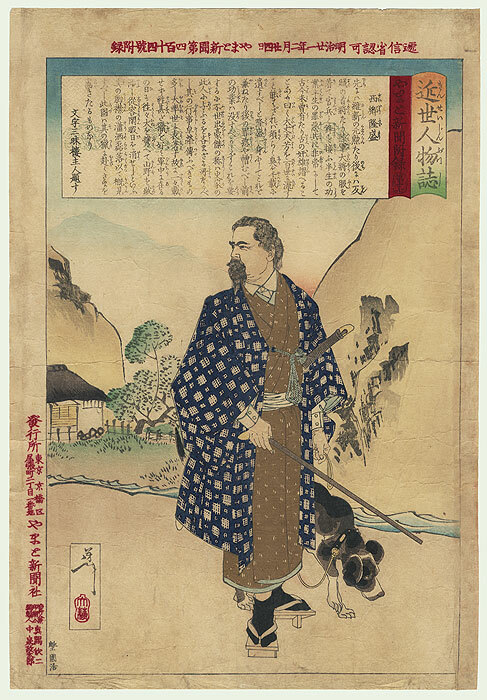 Saigō was a conservative, old-style samurai, who still lived with the values of honour and purpose. In January 1877, he led the Satsuma rebellion and attacked the government troops in Kumamoto sending 40,000 men, mostly peasants armed with guns, against a force of 300,000 samurai officers and conscript soldiers. The ensuing six-week battle ended in a victory for the government’s conscript army. Saigō and the last 400 of his loyal men retreated to Kagoshima, where he committed seppuku after having suffered a severe hip injury in battle on September 24, 1877. He is seen as a paragon of virtue by many and considered the last real samurai to die as such. A famous bronze statue of Saigō in hunting attire with his dog stands in Ueno Park, Tokyo. Made by Takamura Koun, it was unveiled on 18 December 1898. A reproduction of the same statue stands on Okinoerabujima, where Saigō had been exiled. Saigō’s last stand against the Meiji government in the Battle of Shiroyama was the historical basis for the 2003 film “The Last Samurai”. Katsumoto, played by Ken Watanabe in the movie, is based on Saigō. Forget about Tom Cruise and enjoy the story of Saigo Takamori played by Ken Watanabe. 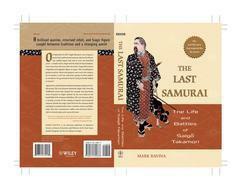 The Last Samurai – The Life and Battles of Saigo Takamori. A good read and I would recommend it to anyone interested in Saigo and the Meiji Restoration. This is a great blog, and you write very well about Japanese history. I’ve promoted a couple of your pieces on my Japan in Pictures page on Facebook. I hope it drove some traffic your way! However, I’d like to ask you not to post links in the comments unless they are related to the actual photo. If the link is clearly related to the photo, then it’s very welcome. Sorry to post this here, but I couldn’t find a more private way to contact you. Hi Cathy, thank you for your kind words. I see, will do in the future. Cheers. Really enjoyed reading the info about Saigo Takamori above. I wonder where you can get copies of that book?? Hello, I usually get my books through Amazon or the Book Depository. I’m sure you can find it at one of those online shops.